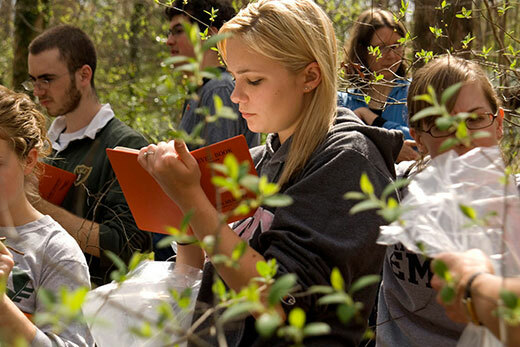 Students participate in a class taught in Lullwater Preserve, just one of the many ways Emory faculty integrate sustainability across the curriculum. The faculty fellows co-lead a Faculty Advisory Council, serve as chairs of Office of Sustainability Initiatives committees and participate in projects and activities that contribute to Emory’s sustainability vision. These include the Piedmont Project, activities to support faculty research and collaboration, and initiatives like an undergraduate Sustainability Certificate, a sustainability-focused Honors Program and a college-wide “Health of the Planet” course. Clinical professor Mindy Goldstein is director of the Turner Environmental Law Clinic and director of the Environmental and Natural Resources Law Program at Emory School of Law. Currently, she is exploring a food purchase agreement to expand purchasing of locally grown food. Her other work focuses on the policies and regulations of sustainable energy and climate change, land use and conservation, sustainable agriculture and urban farming, protection of natural resources and access to information. Eri Saikawa is an associate professor in environmental sciences. She is currently developing Emory’s resiliency plan. She also conducts interdisciplinary research on the environment with her main focus on the sources and the magnitudes of emissions linked to air pollution, ozone depletion and global warming, as well as the impacts of these emissions on humans and society. Kimberly Wallace-Sanders is an associate professor of American and African-American studies. She is currently contributing to the new environmental justice projects on campus and will be leading the Piedmont Project for graduate students to encourage integration of sustainability into their teaching, research and service to improve their professional opportunities. Wallace-Sanders is completing a book called “Framing Shadows: Portraits of African American Women and White Children.” It will be the largest collection of domestic portraiture of its kind.